This is a library for monochrome OLEDs based on SSD1306 drivers. 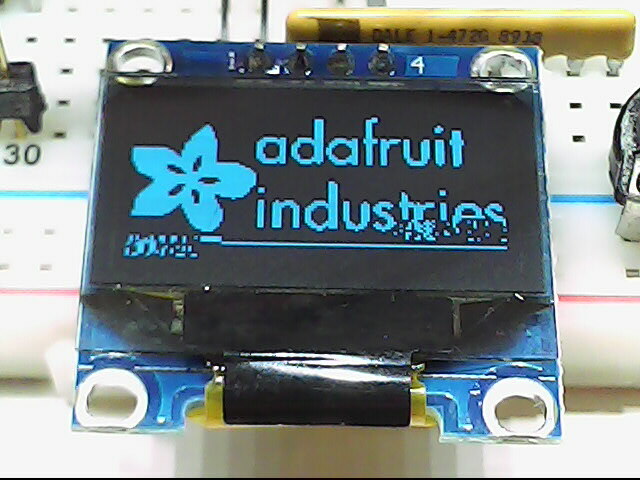 This library is a stripped-down version of the original Adafruit_SSD1306 library v1.1.2. This version of the library does not depend on the Adafruit_GFX library and has a much smaller memory footprint than the full version, but most of the graphical features are missing. The Library only supports I2C communication. This Library uses a full display buffer. For a 128x64 display this requires 128x64 = 8kbit = 1kB of RAM for the display buffer. Since the STM8S103 has only 1kB RAM total, there is no way that this will fit. If you ignore the compiler warnings about insufficient RAM, it will still run, but you will see a graphical memory dump in the lower part of your display. If you are careful not to modify that part of the memory the program still works, but is not terribly useful. See the oled-mini example. The u8g2 library by Oli Kraus is able to use less RAM by rendering the image in multiple stripes. This is slower, but saves RAM. I am thinking of porting that library, but don't hold your breath for it. // Initialize with the I2C addr 0x3C. Some displays use 0x3D instead. for (y=0; y<HEIGHT-8; y+=8) // don't alter the stack! These tiny displays communicate usually via I2C, but SPI versions do exist. My display uses the I2C address 0x3C, but there are similar displays out there configured to use the address 0x3D. Faster I2C transfer is supported by the I2C library, but to use it you have to modify the source code for the Mini_SSD1306 library. Make this configurable in the instantiation function.